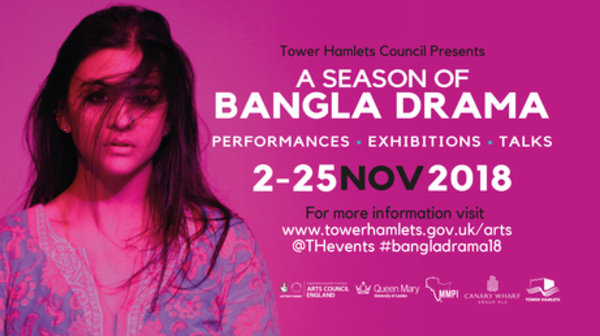 This year’s Season of Bangla Drama, a festival of dance, music and theatre, returns to Tower Hamlets from 2-25 November in a celebration of culture, gender and identity. Twelve theatrical productions across four venues will explore politics, history, fact and fiction in a variety of traditional and contemporary performances, which are all relevant to the diversity of east London with a uniquely British Bengali perspective. 100 years on from the vote, this year’s season of Bangla sees a celebration of womanhood with a plethora of female characters in key roles. This is notable in The Floating Hearts which portrays the lives of five ordinary women who face profound challenges through society’s expectation. Woman: An Altered Image exposes the social, cultural, and psychological conflicts faced by women, particularly through marginalization, prostitution and human trafficking. War Heroines focuses on the horrific struggle of women during the war and in its aftermath. Performances in English and Bengali languages also delve into themes of freedom, changing values in a fast paced world and the anti-racism movement. Season of Bangla Drama opens with Brick Lane 78, a stirring performance about the racist murder of Bangladeshi garment worker Altab Ali and the mobilisation of a community that stood up to defend its identity, rights and dignity. Another prominent theme the fight for national identity. The independence war of 1971 is explored through The Interrogation, depicting a woman being interrogated by a collaborator. To Father a Nation, political story of activism, liberation and mortality during the turbulent times surrounding the partition of India. For some lighter relief, both Class Conflict and Open Couple ask the enduring question, does love conquer all? The former is classic musical theatre using folk music and dance to tell the story of a snake charmer’s daughter, a prince, and a poisonous snake. Will love prevail over class conflict? The latter is a satire exploring whether an open relationship can ever be truly successful and whether there is a double-standard between husbands and wives? Comedy also strikes in H1TM4N, an absurdist and identity-crisis ridden story set against the workday backdrop of an assassination agency. With the pressure of sales targets and tax returns, it asks who we think we are, who we want to be and who we really are. 4 Tagore short stories are recounted by Kids for Kids in Chaturango-4 Acts. Children are central in all 4 plays, which explore innocence, naivety and vulnerability as well as the need for points of human connection in a hostile world. These universal truths are as relevant today as they were in Tagore’s time. The permanence of ideology in a fast-changing world is questioned in The Last Communist, and the role of family members and values in an equally fast-changing world is at the centre of Cries of The Earth, which ends with the heart-breaking abandonment of an elderly man. This fantastic festival of drama incorporates politics, history, fact and fiction with women in many leading roles and provides a snapshot of society that exposes the frailty as well as the moral strength of the age-old human condition. All are relevant to the cross-cultural influences of British Bengali life in 21C East London and there’s plenty to laugh (and cry) about along with some music, song and dance to remind us of the life-affirming power of theatre! A fringe programme of talks, walks and exhibitions supplements the productions, running for three weeks. A Season of Bangla Drama is a great platform for writers, actors, directors and producers, as well as being a treat for both established and newly developed audiences . Please download the brochure below for full details.